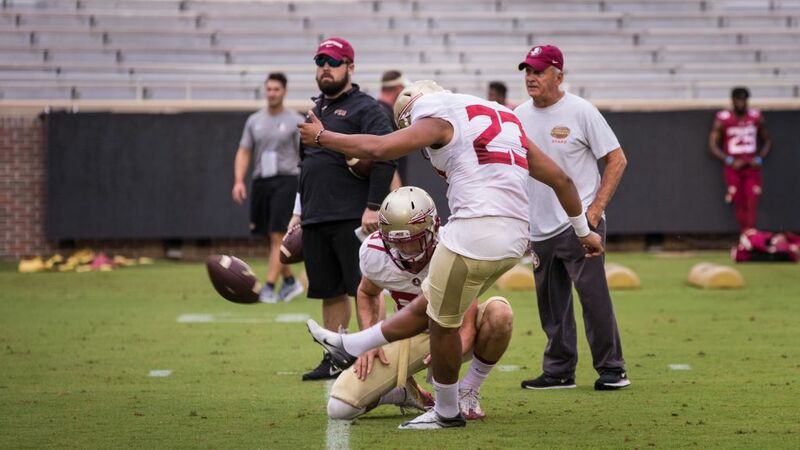 TALLAHASSEE, Fla. – With three consecutive primetime kickoffs to open the season, the Florida State football team on Sunday held its first scrimmage of fall camp under the lights at Doak Campbell Stadium. The Seminoles open with Alabama at 8 p.m., followed by the home-opener against ULM at 7 and another 8 p.m. game against Miami the next week. Fisher said the scrimmage itself was typical for a first outing, with the defense getting the better of the action early on and the offense rallying back as things progressed. “Both sides had their moments,” Fisher said. Now in the thick of fall camp with the season opener less than three weeks away, the Seminoles will take a day off on Monday before returning to the practice fields on Tuesday. After appearing in only five games a year ago, Derrick Kelly is apparently back in a big way. A redshirt junior lineman who has rotated between guard and tackle throughout his career, Kelly began taking reps at left tackle about a week ago and has edged in front of his competition for the starting job. Kelly, a native of nearby Gretna, Fla., is something of a surprise contender for the left tackle spot. He didn’t work there in the spring and wasn’t mentioned among the candidates at the start of camp. Kelly’s credentials, however, are as good as virtually anyone else on the roster. He’s got six career starts, including two last season, and was one of the more coveted offensive line recruits in the 2014 class. Fisher offered praise for his specialists, and especially kicker Ricky Aguayo, who Fisher said is kicking the ball with the “thump” that was his older brother Roberto’s trademark during his tenure at FSU. Aguayo looked sharp during the open portion of practice and Fisher said he capped one of the offense’s drives with a “real nice” field goal. Speaking of specialists, there may be some clarity at both the kick and punt returner spots. Derwin James and Keith Gavin seem to have settled in as the top-choice kick return unit, while cornerback Tarvarus McFadden is getting some work at punt returner. If there’s a common thread between the three (besides the fact that James and McFadden are both defensive backs), it’s their large body types – at least by recent returner standards. Gavin is 6-3, 225 pounds, while James stands at 6-3, 211 and McFadden checks in at 6-2, 198. That’s a far cry from the smaller Kermit Whitfield (5-8, 183) and Bobo Wilson (5-11, 176), who manned the return posts for much of their careers. Fisher pointed to Gavin’s late 66-yard kickoff return at the Orange Bowl as an example. Met head-on by Michigan defenders after a moment of hesitation, Gavin broke through would-be tacklers that might have stopped a smaller man. Had he not, one of FSU’s biggest wins of the 2016 season might have gone the other way. Fisher estimated between 10-12 players missed the scrimmage due to various illnesses or ailments, but the good news is that he expects everyone back at some point this week. “All the guys that weren’t there playing should be either at practice or at practice by last week,” Fisher said.